Before this day is over, I suppose I should finish the cake post I started last night. 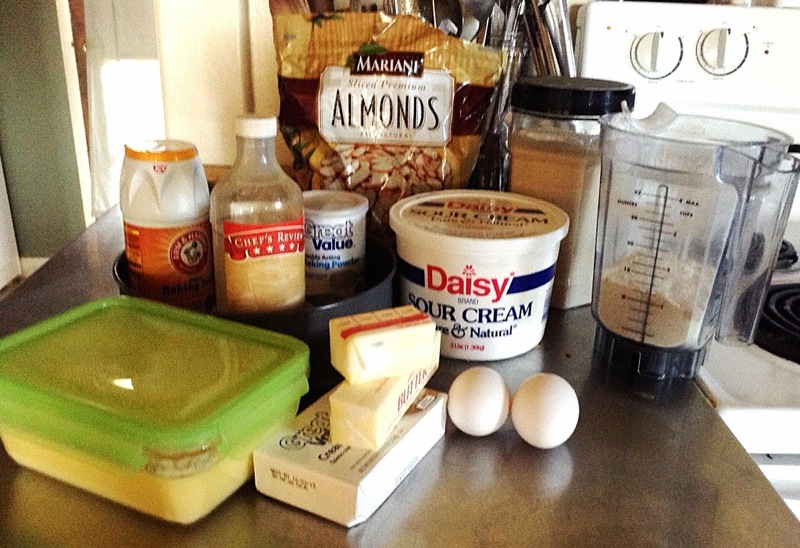 When we last met, we had all our ingredients prepped and ready for an early morning session in the kitchen. Thankfully my alarm went off, I got my shower, and armed with coffee, I started back in. You’ll have to pardon the quality of these pictures as it was still dark outside. Get out your participants and your greased springform pan. 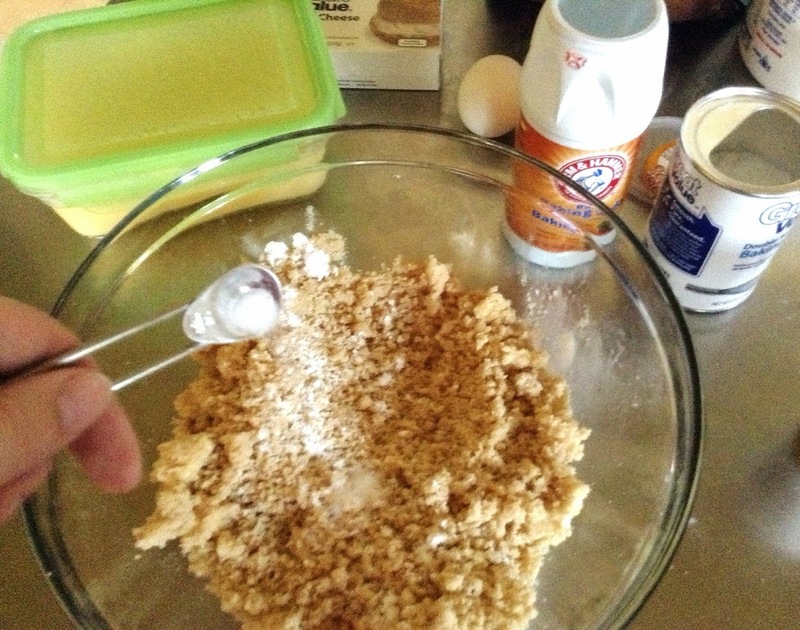 Pour the small bowl of sour cream into the bowl of crumble and mix well. 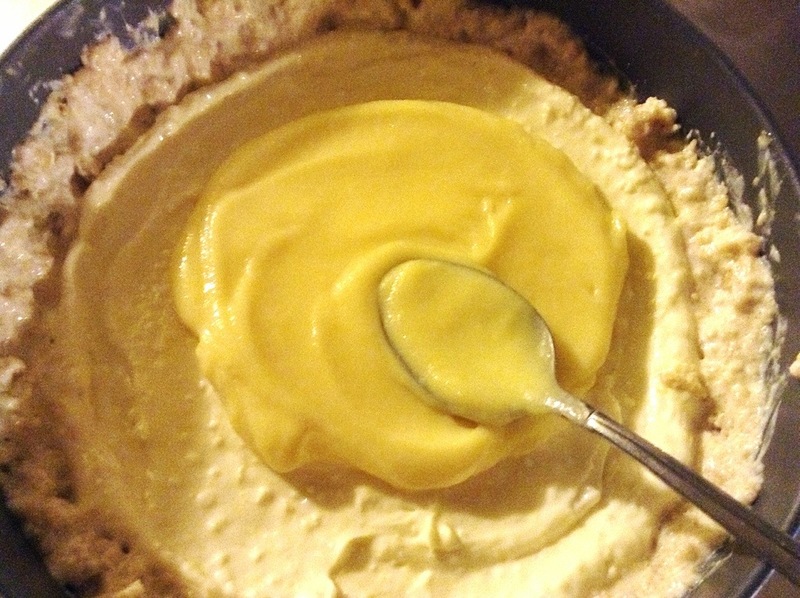 Then pour this into your springform and spread it so that the batter comes about two thirds up the sides of the pan. Next comes the bowl of cream cheese. 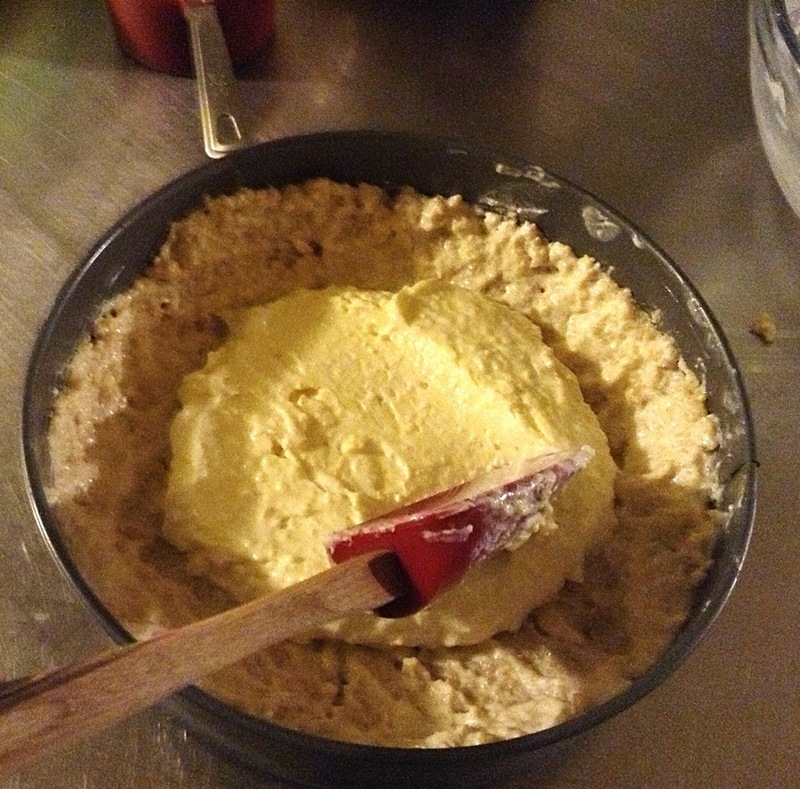 Plop it on top of the batter and spread until it is smooth. And now your fruit filling. Remember, you can use just about any jam you want, but I have to put in a good word for lemon curd here. I just feel like it gets a bad rap because of its name. I don’t know who came up with the name lemon curd but there are definitely no curds or curdling involved, unless of course you make it wrong. 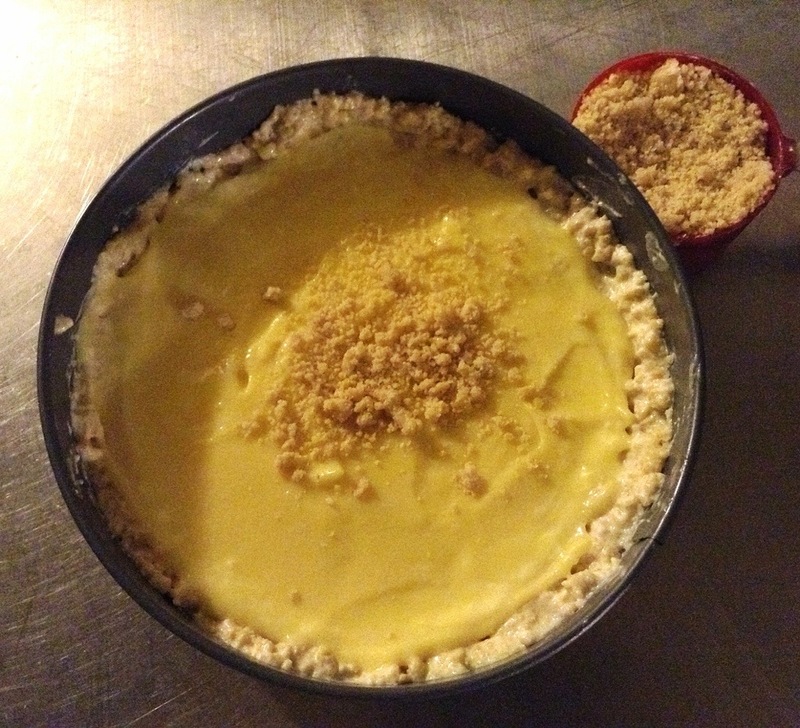 It’s just a lovely silky, buttery, lemony custard. But enough about lemons, curdled or not. 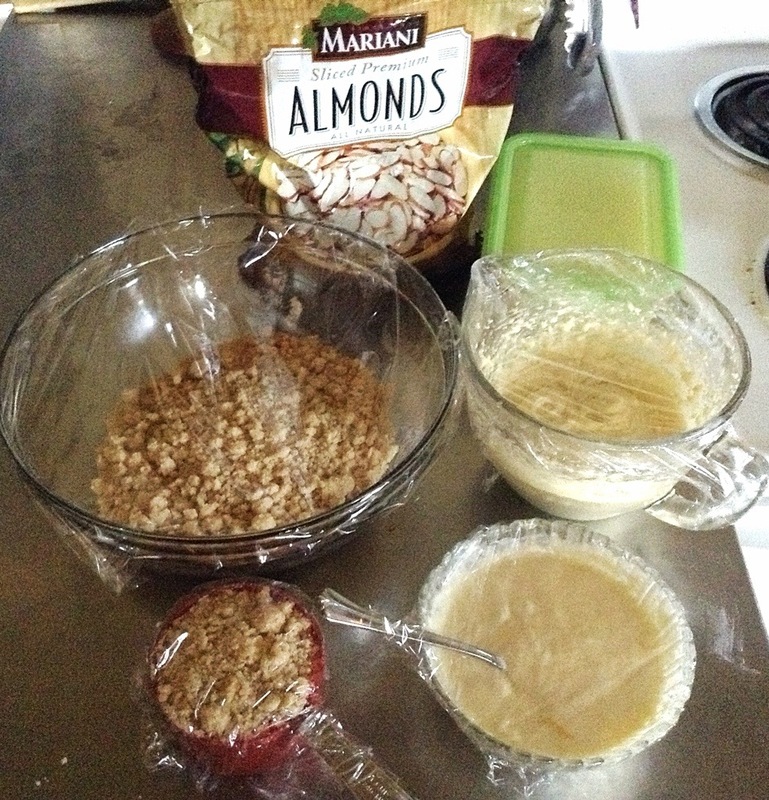 Use what you like and spread it on top of the cream cheese-about half a cup. 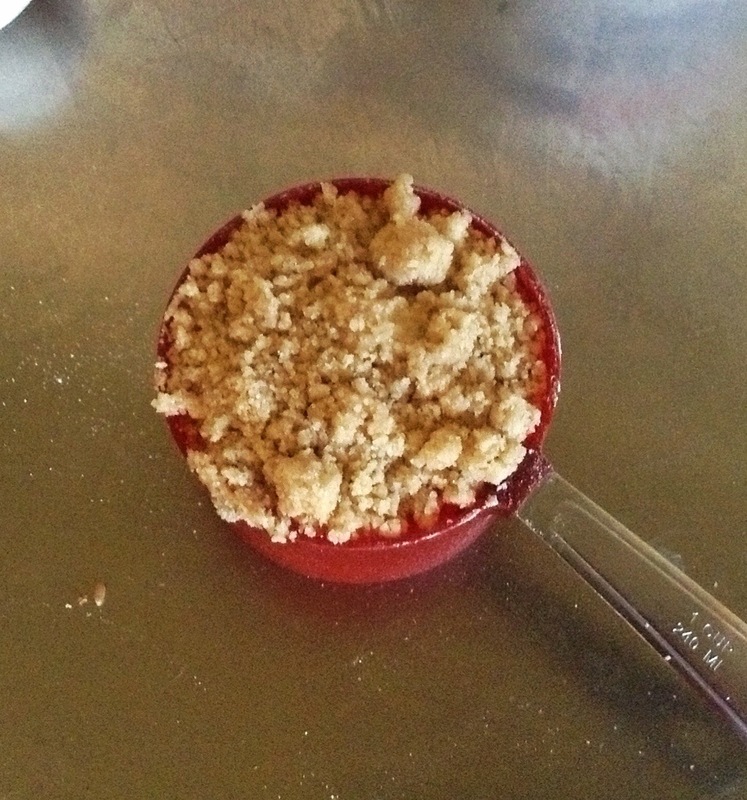 Now you get to use that cup of crumble you set aside. Sprinkle it evenly on the other layers. 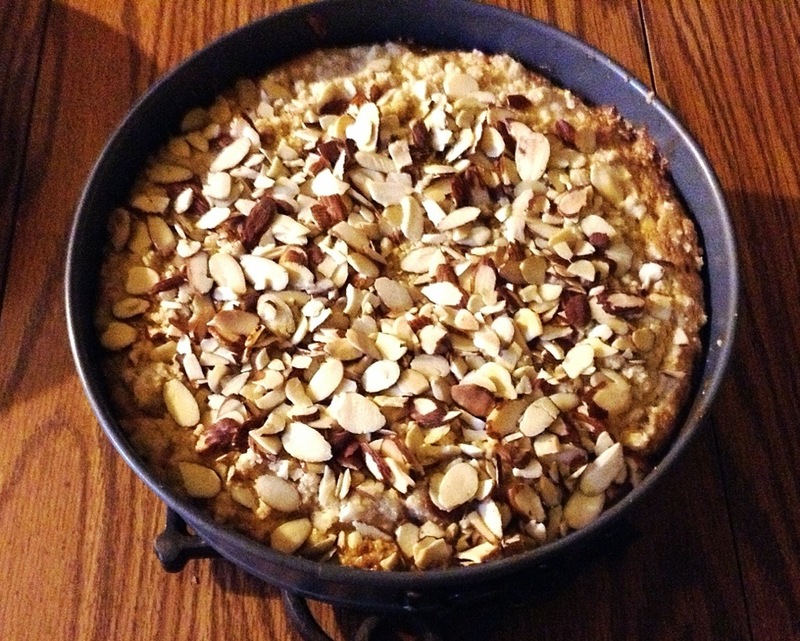 And of course, top with slivered almonds. Now it’s ready to slide into the oven, which I forgot to mention should have been preheated to 350 before I got in the shower. Oh, and pay no attention to the bottom of my oven. Give it about forty- five minutes to bake. It will give you time to go wake up your kids and tell them to get dressed about forty-five times. The edges should be nice and brown by then, but the middle will still feel jiggly because of the fruit filling. 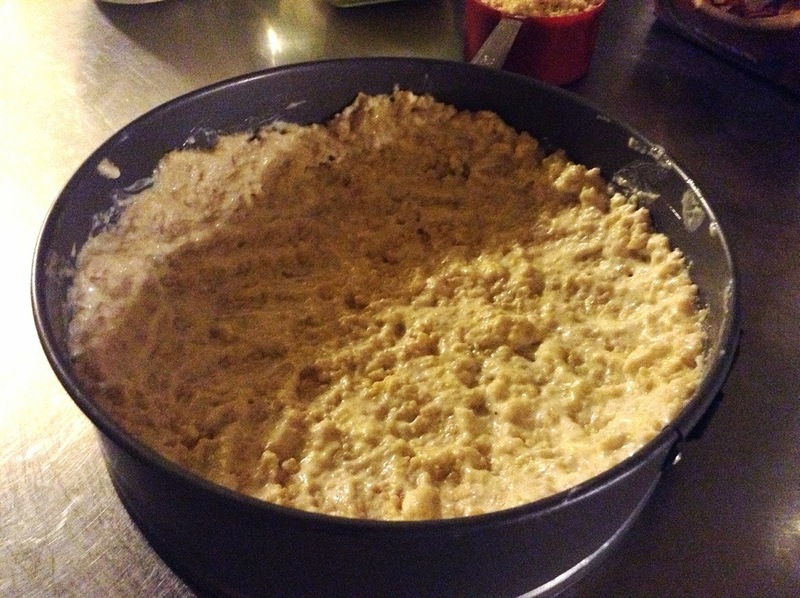 Pull it out and let it cool a bit or the filling will run all over the place. This will also give the sun time to get up so you can get some decent pictures. Remove the sides of the pan and dish it up with some nice fruit, or bacon if you need something healthy. Oh, and of course a cup of coffee. Here’s a side view of the layers. So all in all, a good start to a good birthday. “Umm, yes,” I said somewhat hesitatingly. “He’s crazy, that guy”, he continued. “Well, uh,…” I eloquently replied. Despite the earthiness of this narrative, by the end I was smiling and thanking him in my mind for giving me a very fitting tribute to my hubby, the man who hunts crickets to bring joy to his little boys. 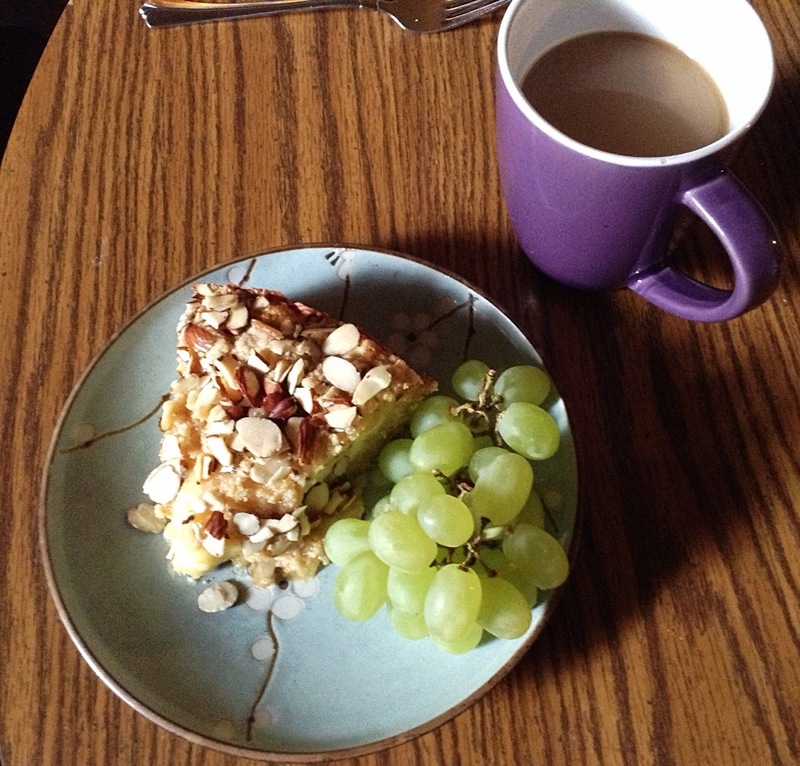 Then I came inside and decided to make him his favorite coffee cake for breakfast. I am going to post this recipe in two stages, because I want to prep for it tonight, and bake it in the morning. I don’t know about you, but our house tends to get a little hectic on Sunday mornings as we try to get out the door to church, so whatever I can do Saturday night to prepare for the morning, I try to do. This isn’t the simplest cake in my arsenal, but it’s a special occasion! So here’s what we need to do tonight. 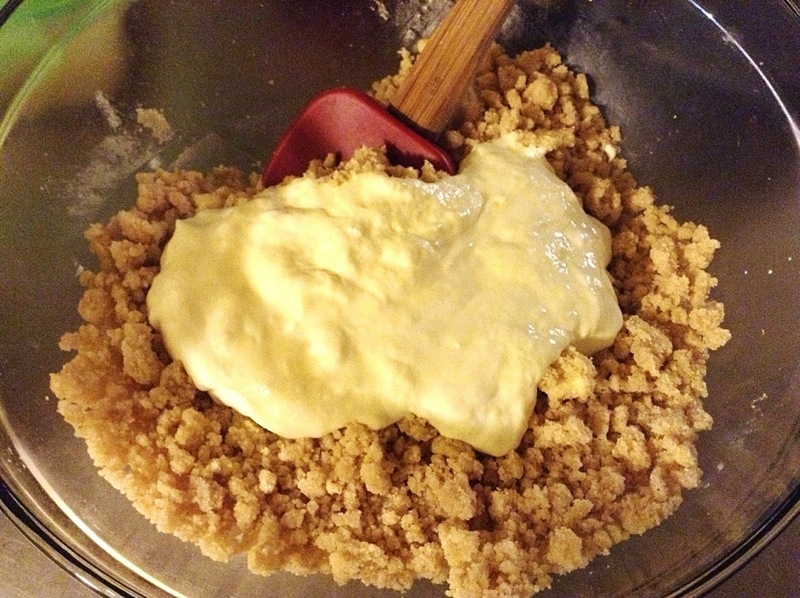 We’re working with pretty basic ingredients here- flour, sugar, butter, sour cream, cream cheese. If you are wondering what’s in the pitcher, it’s whole wheat pastry flour I just ground in my vita-mix blender. I’m all about health here. Not really, but I have been playing around with different flours since I got the vita-mix for mother’s day, so I’m gonna try whole wheat this time. Usually I would just use all purpose flour for this recipe. Step one, grease a 9 or 10 inch spring form pan and set it aside ’til morning. 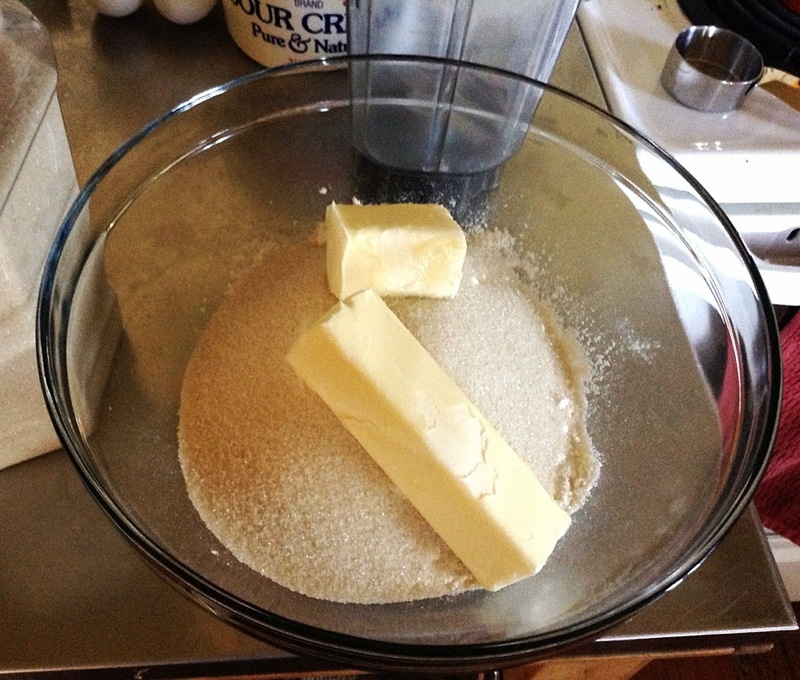 Step two, in a large bowl combine 2 1/4 cups of flour, 3/4 cup of sugar and 1 1/2 sticks of butter. 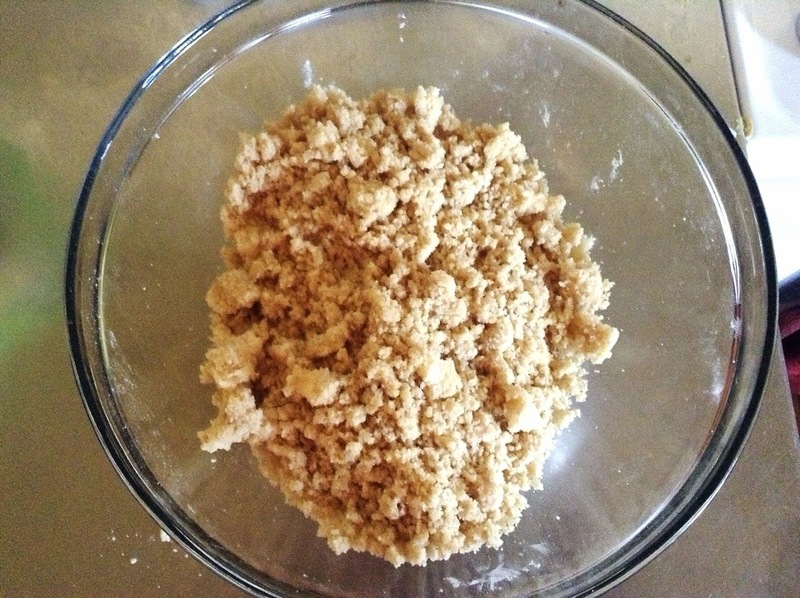 Crumble it up with your fingers until it looks like this. 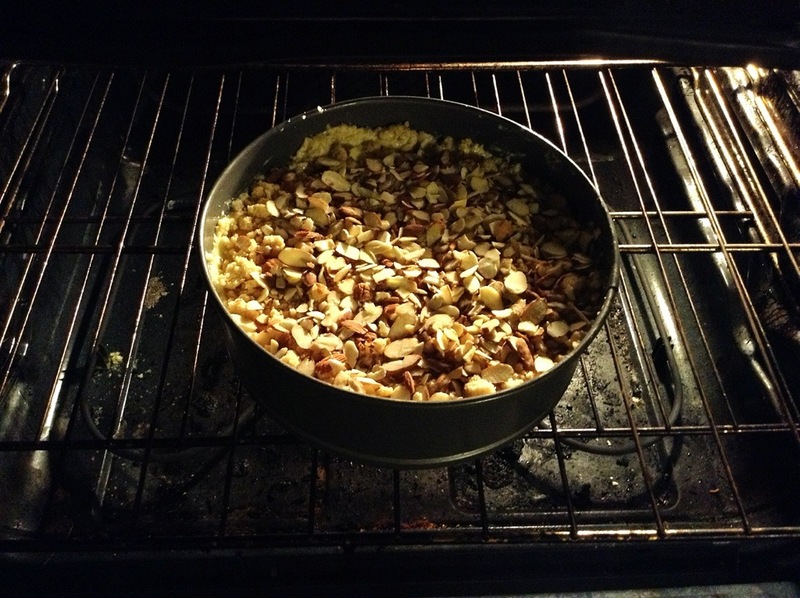 Remember my apple crisp? Now remove one cup of this and set it in the fridge ’til morning. 1/2 teaspoon each of baking soda, baking powder and salt. Set it in the fridge ’til morning. Are you sensing a pattern here? 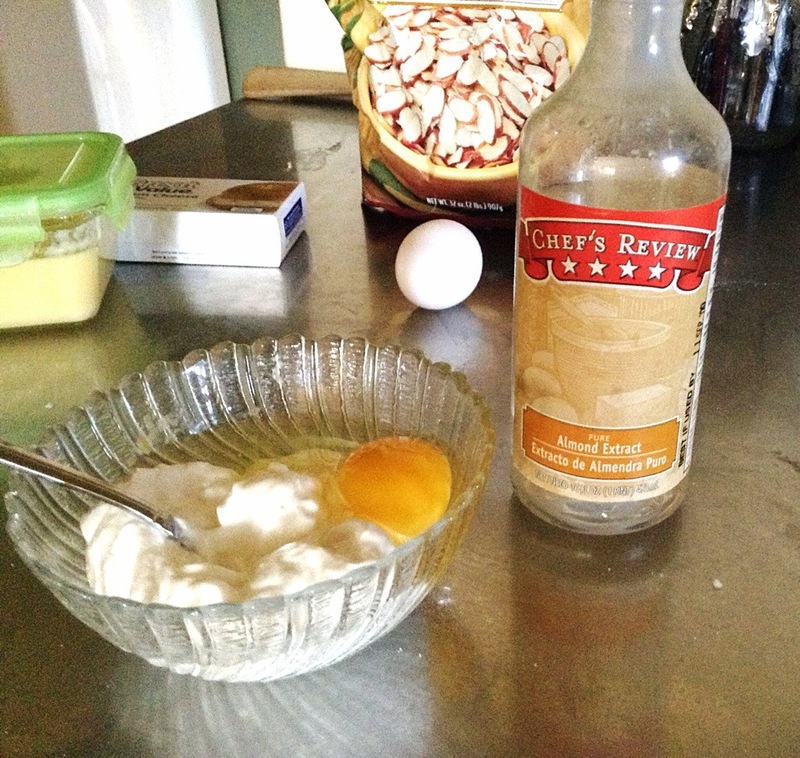 1 egg, 3/4 cup of sour cream and a splash of almond extract. Confession. I have had this bottle of almond extract for eleven years. I use it very rarely, and a little goes a long way. But it still smells good so I keep using it. 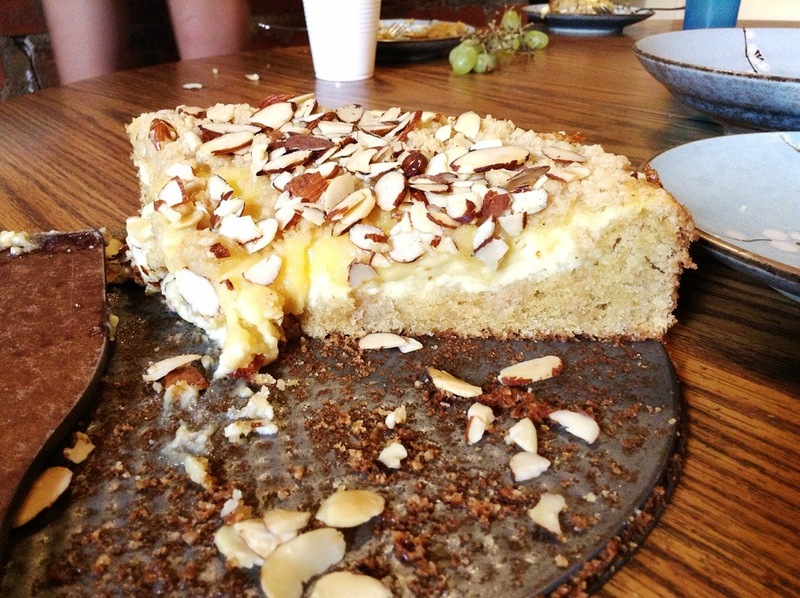 If you don’t have almond, vanilla works just fine. Set it in the fridge ’til morning. 8 oz. 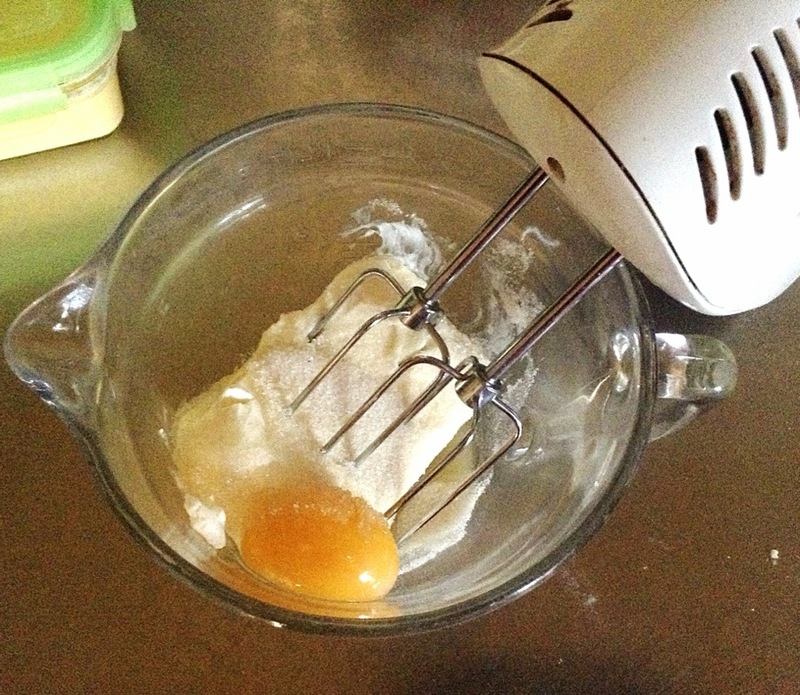 cream cheese, another egg and 1/4 cup of sugar until smooth. Aaaaaand set it in the fridge ’til morning. So here is what you have ready to go in the a.m. so you can whip that cake into the oven and still have time to curl your hair for church. The last two ingredients need no prep. 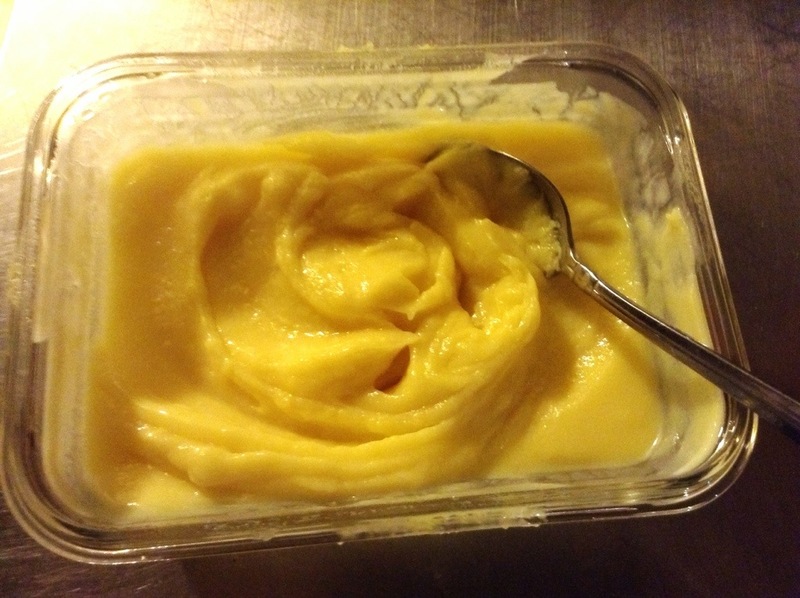 I have some homemade lemon curd there in the tupperware. This is another one of those odd items that I almost always have on hand, because the hubby is not only French, he’s also half British. The original recipe calls for seedless raspberry jam, but I have used lots of different fruit spreads, and haven’t hit on a bad one yet. So lemon, raspberry, strawberry, blackberry- pick your poison. 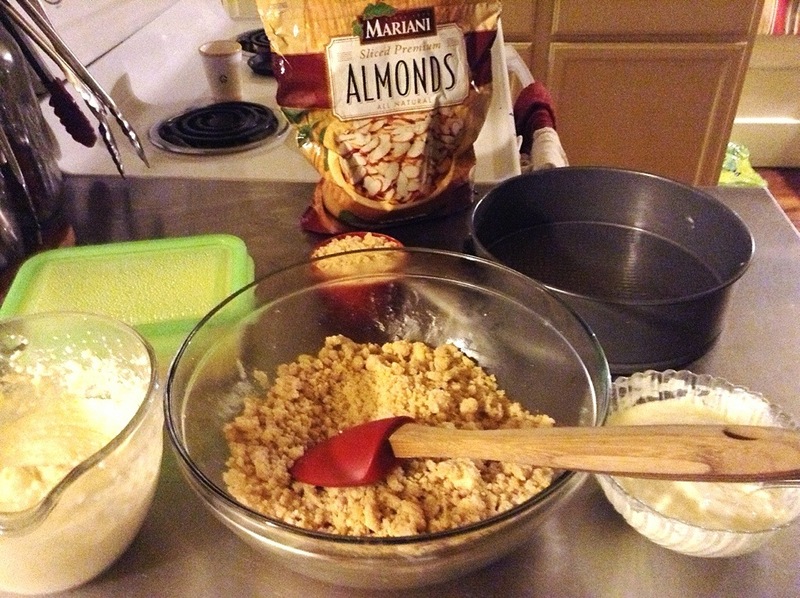 And you will need slivered almonds. 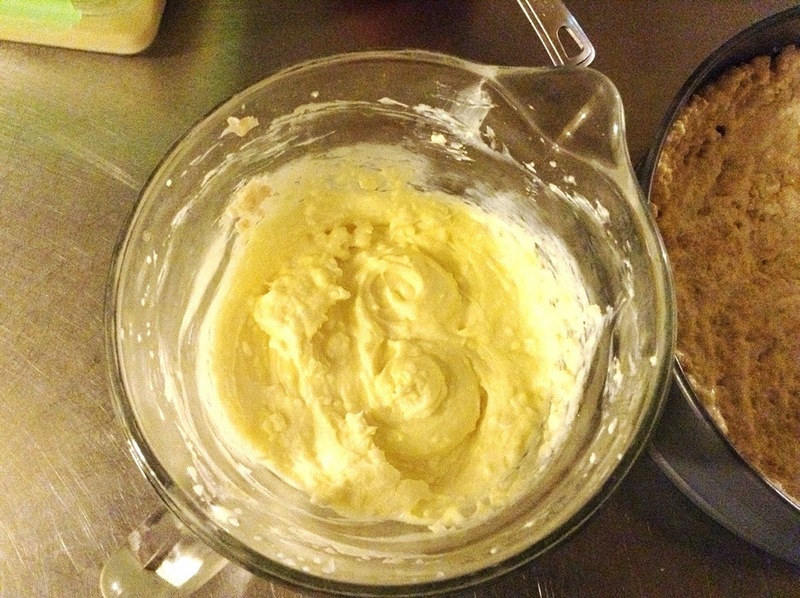 So now, stay tuned for the exciting conclusion of this fantastic birthday boy recipe!